The Bottom Billion is an elegant and impassioned synthesis from one of the world's leading experts on Africa and poverty. It was hailed as "the best non-fiction book so far this year" by Nicholas Kristoff of The New York Times. 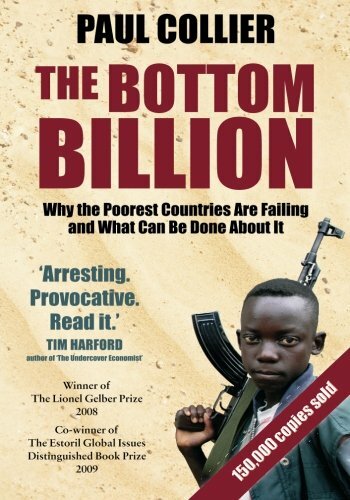 In this elegant and impassioned synthesis from one of the world's leading experts on Africa and poverty, economist Paul Collier writes persuasively that although nearly five billion of the world's people are beginning to climb from desperate poverty and to benefit from globalization's reach to developing countries, there is a "bottom billion" of the world's poor whose countries, largely immune to the forces of global economy, are falling farther behind and are in danger of falling apart, separating permanently and tragically from the rest of the world. Collier identifies and explains the four traps that prevent the homelands of the world's billion poorest people from growing and receiving the benefits of globalization - civil war, the discovery and export of natural resources in otherwise unstable economies, being landlocked and therefore unable to participate in the global economy without great cost, and finally, ineffective governance. As he demonstrates that these billion people are quite likely in danger of being irretrievably left behind, Collier argues that we cannot take a "headless heart" approach to these seemingly intractable problems; rather, that we must harness our despair and our moral outrage at these inequities to a reasoned and thorough understanding of the complex and interconnected problems that the world's poorest people face. Winner of Co-winner of the Estoril Global Issues Distinguished Book Prize, 2009.